According to The Pulse Of Radio, Oscar-winning director Martin Scorsese is planning to direct a movie about the legendary punk band the RAMONES. There is no timetable or writer for the film yet, which Scorsese could shoot after he finishes his upcoming project, “Silence”, next year. The news about the movie comes as the managers of the group’s estate have revealed plans to celebrate the 40th anniversary of their self-titled debut album in 2016. Those plans include a documentary separate from Scorsese‘s film, a play and a book about the band’s early years. All four of the original RAMONES are now dead, with the last, drummer Tommy Ramone, passing away earlier this year. Rob Zombie just hosted a tribute to guitarist Johnny Ramone in Los Angeles to mark the 10th anniversary of his passing. Johnny‘s portion of the RAMONES estate is handled by his widow Linda, while late singer Joey Ramone‘s interests are now handled by his brother Mickey. Although the two sides have had disputes in the past, they are now said to be “moving in one direction together as a team” with regards to the 40th-anniversary plans. 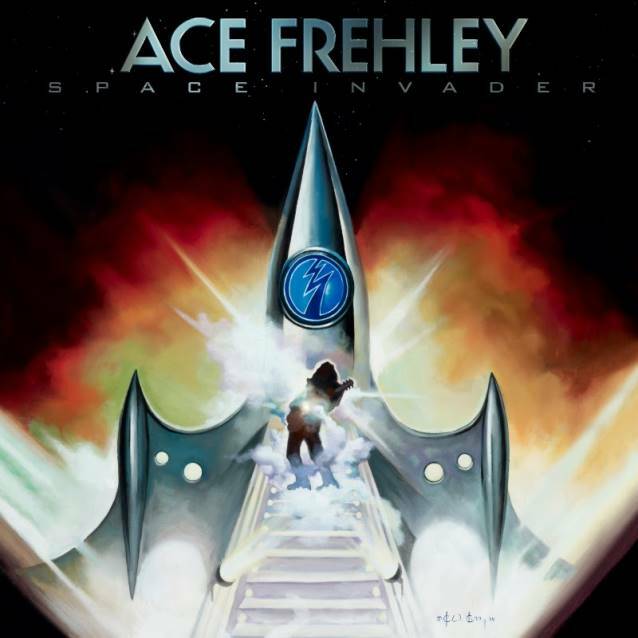 “Space Invader”, the first new solo album from original KISS guitarist Ace Frehley in five years, sold around 19,000 copies in the United States in its first week of release to land at position No. 9 on The Billboard 200 chart. The CD arrived in stores on August 19 via Entertainment One Music (eOne Music). “Space Invader”, which was made available in Europe on August 18 (three days earlier in Germany and Scandinavia) through SPV/Steamhammer, includes 11 brand new original songs as well as a cover of Steve Miller‘s “The Joker”. The “Space Invader” cover artwork was created by Frehley‘s longtime friend, artist Ken Kelly, who designed the iconic cover art for two of KISS‘ best-selling LPs “Destroyer” (1976) and “Love Gun” (1977). “It’s with complete sadness that we have to announce the passing of bassist Tim ‘Rawbiz’ Williams. “Tim played bass for SUICIDAL TENDENCIES for almost four years until recently. 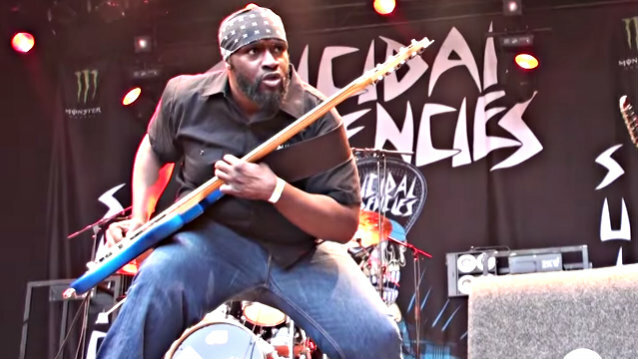 Williams is credited with playing bass on only one song on SUICIDAL TENDENCIES‘ latest album, “13”, which came out in March 2013. The first studio CD in 13 years from SUICIDAL TENDENCIES sold around 3,200 copies in the United States in its first week of release to debut at position No. 187 on The Billboard 200 chart. In addition to playing with SUICIDAL TENDENCIES since 2011, Williams has worked with everyone from Toni Braxton to BOYZ II MEN to Keyshia Cole. According to Billboard, he also appeared on Sean “Diddy” Combs‘ 2009 reality show “Making His Band”, which documented the hip-hop mogul’s search for Diddy‘s backing group. 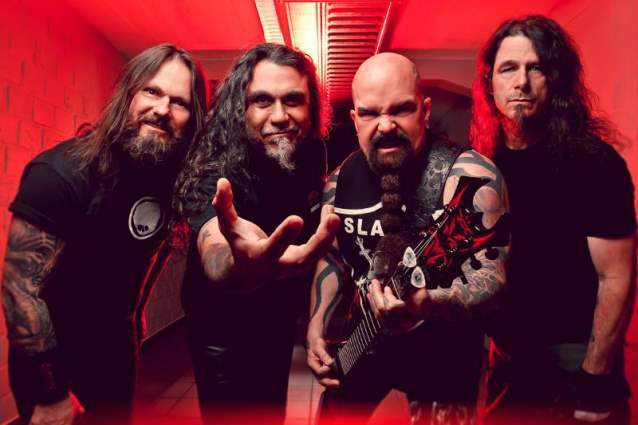 SLAYER has returned to the studio to resume recording its new album for a tentative early 2015 release. The effort will make SLAYER history as it will be released on Nuclear Blast Records through the band’s own label imprint, closing out a 28-year relationship with Rick Rubin and American Recordings. It will also be SLAYER‘s first album without the group’s co-founding guitarist Jeff Hanneman, who passed away in May 2013 from alcohol-related cirrhosis of the liver. He is credited for writing many of SLAYER‘s classic songs, including “Angel Of Death” and “South Of Heaven”. SLAYER‘s follow-up to 2009’s “World Painted Blood” will include the song “Implode”, which was made available as a free download as a “thank you” to the band’s fans for their continued support following SLAYER‘s surprise performance at this past April’s Revolver Golden Gods awards in Los Angeles. The track was recorded in April at Henson Studios in Los Angeles and produced by Terry Date and co-produced by Greg Fidelman. At the time of the Metal Hammer interview, it was still undecided as to whether any of Hanneman‘s previously unused ideas would make it to the next SLAYER album. “There was a song we finished on the last record, but I know for a fact [Jeff] wanted to rewrite the lyrics on, so that one got to deconstruct and make better,” Kerry said. Joining King and bassist/vocalist Tom Araya during the sessions for SLAYER‘s new album are returning drummer Paul Bostaph, who replaced Dave Lombardo last year, and guitarist Gary Holt (also of EXODUS), who has been filling in for Hanneman on tour for the past four and a half years. Asked if Holt will play on the new SLAYER album, Kerry told Canada’s Metro in an October 2013 interview: “I’ve told Gary that I’d like him to play some leads, just to keep it interesting. “We’ve always been a two-guitar attack, so if you’re looking to have a segment like the ‘Angel Of Death’ lead trade-off, you can’t do that with one guitar. “As far as Gary being a contributing writer, number one, fans aren’t ready for it, and number two, that’s like throwing somebody to the wolves. Original SLAYER drummer Dave Lombardo was effectively fired from SLAYER after sitting out the band’s Australian tour in February/March 2013 due to a contract dispute with the other members of the group. Filling in for him was Jon Dette (TESTAMENT, ANTHRAX). Parlophone Records (BMG/INgrooves Music Group for North America) will follow the 2012/13 IRON MAIDEN vinyl picture disc reissues of the first eight IRON MAIDEN albums, which spanned the 1980s, with brand new pressings of the albums in heavyweight 180-gram black vinyl. In conjunction with these premium album releases, a strictly limited one-off run of the seven-inch singles from each respective album will be made available. These highly collectable black vinyl singles will be cut from the original analogue master tapes. Released in replica artwork packaging, they are sure to become a must-have item for fans, collectors and anyone who missed out first time round. The albums will also be cut from the original analogue master tapes and packaged in identical artwork to the initial 1980s releases. 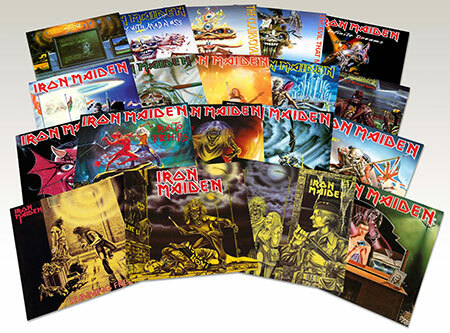 As a bonus, the first batch of album releases (“Iron Maiden”, “Killers”, “The Number Of The Beast”) will also be made available in a Collector’s Box sized to house all eight albums. This package will be a strictly limited edition and available while stocks last. The release of these high-quality, black vinyl records offers optimum choice to fans who would like to own a piece of MAIDEN‘s authentic 1980s vinyl sound, or for those simply wanting to rediscover this much loved, iconic format. Coupled with the end of the Maiden England World Tour which began in North America in 2012 and finished last month at Knebworth Park’s Sonisphere festival, this now completes MAIDEN‘s 1980s touring and catalogue reissues cycle, so the band are free to focus on their dynamic future plans. On Oct. 21, he’ll unveil his seventh album (not counting the holiday offering), and the first on his own BFI Records. But you can listed to the record’s first single, ‘Can’t Break Me Down,’ right now on Idol’s website. It’s a pretty poppy song, but not without Idol’s trademark sneer (yes, you can hear it) and guitarist Steve Stevens’ familiar crunch (yes, he’s back in Idol’s band). 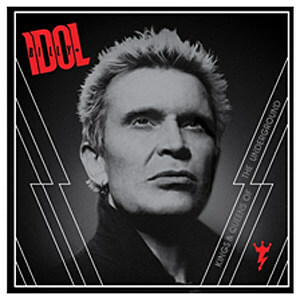 The album comes out two weeks following the publication of Idol’s autobiography, ‘Dancing With Myself.’ He’ll also launch a short European tour — including shows in London and Milan — a few weeks after the record comes out. More dates are promised for the future, and will most likely be announced closer to the album’s release. BUTCHER BABIES‘ Carla Harvey (vocals) comments: “It was a blast recording songs that we have been fans of our entire lives and putting our spin on them. To pre-order “Uncovered”, please visit ButcherBabiesOfficial.com. Shortly before the release of “Uncovered”, BUTCHER BABIES will embark on their first headlining run in the U.S. The band will end their tour playing at this year’s Knotfest in San Bernardino, California.